RBTH presents a selection of views from leading Russian media on international events, featuring reports on a flurry of visits to Moscow by Middle Eastern leaders in for talks on Syria and the deployment of updated atomic weapons by the U.S. in Germany, as well as an interview with the director of the American Center at the Moscow Library of International Literature about its alleged closure. The business daily RBK reports that in relation to the news about Russia increasing its military aid to Syria, the leaders of several Middle Eastern countries have immediately come to Moscow to meet with Russian President Vladimir Putin, each with their own plan for resolving the military conflict. 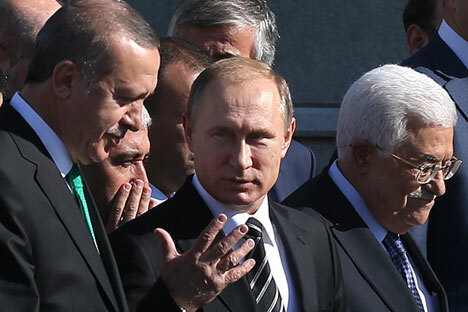 In the evening of Sept. 22 Putin met with Chairman of the Palestine Liberation Organization Mahmoud Abbas and on Sept. 23 he spoke with Turkish President Recep Erdoğan. Earlier, on Sept. 21, Putin held talks with Israeli President Benjamin Netanyahu, who had not been to Moscow for two years. The talks centered on the situation in Syria: Russia and Israel agreed to create a mechanism for preventing possible incidents between the armies of the two countries. "The leaders coming to Moscow have different agendas: Netanyahu came to discuss how to counter Hezbollah, Abbas to complain about Netanyahu, while Saudi Arabia needs to know that it can buy weapons and have the support of capitals other than Washington," said Ariel Cohen, director of International Market Analysis. "Despite the ever more frequent contact that Putin is making with international leaders, Russia is still in half-isolation, a position that, however, does not exclude a short meeting between Putin and Obama in New York at the UN General Assembly next week," said Cohen. The Vzglyad online newspaper reports that the United States plans to deploy 20 modified B61-12 atomic bombs in Germany. The town of Buchel is the only known place in Germany that contains American nuclear weapons. There are no U.S. military planes here. Earlier, this airbase contained tactical weapons of the same group – 20 units of a previous modification. Therefore, what is happening is not the deployment of new weapons but rather the modernization and improvement of the old ones. These bombs are made to strike bunkers and other underground objectives and communications and are not strategic weapons as such but rather front-line weapons. Because of their "nonstrategic" character these weapons have never been included in any Soviet-American and Russian-American nuclear disarmament agreements. There are also 20 such bombs in the north of Belgium, in the town of Kleine Brogel, while Italy and Turkey possess nine of these weapons on their territories. The newspaper writes that the U.S. will not directly allow the German political administration to manage the nuclear weapons. Another problem concerning the tactical nuclear arsenal is the so-called system of joint management. Formally, this system does not violate the non-proliferation regime because Germany is not being given technologies for producing nuclear weapons. The problem is not only in allowing German pilots access to control of the weapons: The issue concerns the global involvement of non-nuclear countries in the joint planning of using the nuclear weapons. Correspondents from the centrist broadsheet Izvestiya have visited the American Center at the Moscow Library of International Literature and talked to its director about the closing of the institution. Director Vadim Duda admits that U.S. Ambassador John Tefft's announcement about the closure of the American Center was an unpleasant surprise also for him. "It is not true. The center hasn't closed. We are just suspending the agreement on the grant, which cannot be extended because of a large number of violations," said Duda. However, he did not explain the essence of the violations, noting only that "the legal hitches in the agreement that allow for political pressure," did not appear "recently," but have accumulated over a long period of time. "The American Center brings in 20,000 visitors annually. This is another reason why closing it is not in our interests," said Duda. The library's management assures everyone that the suspension of the grant is only temporary and that cooperation with the Americans will resume as soon as the agreement is freed from the "legal hitches."